Can I get heated seats? Do I have to get a sunroof? Find out what you need to know about Land Rover features right here. Terrain selectorSelect electronic chassis control settings for a specific terrain type. Select electronic chassis control settings for a specific terrain type. DVD changer for entertainment systemRequires and in addition to entertainment system. Requires and in addition to entertainment system. Electrically heated windshieldLayer within windshield creates heat, quickly melting ice on the windshield. Layer within windshield creates heat, quickly melting ice on the windshield. Entertainment system with dual headrest screensA DVD player and two front headrest-mounted screens. A DVD player and two front headrest-mounted screens. Off-road navigation systemEnables navigation even without roads. Requires and does not include the value of a navigation system. Enables navigation even without roads. Requires and does not include the value of a navigation system. Glass roof panel(s)One or more glass panels in the roof that cannot be opened or removed. One or more glass panels in the roof that cannot be opened or removed. Fog light, rearMake it easier for following vehicles to see the vehicle in fog. Make it easier for following vehicles to see the vehicle in fog. Upgraded leather upholsteryNo additional value over leather upholstery because no way to standardize across all models. No additional value over leather upholstery because no way to standardize across all models. Wood trimReal wood trim on instrument panel, door panels, and/or center console. 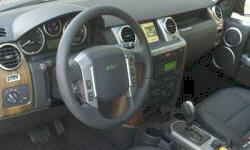 Real wood trim on instrument panel, door panels, and/or center console. Air suspension, auto-leveling and height adjustableAir springs automatically level the vehicle and enable manual adjustment of ride height. Air springs automatically level the vehicle and enable manual adjustment of ride height. 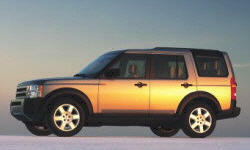 None of our members have yet commented on the available features of the 2009 Land Rover .